Dr Janet Lindsay Greig was the first woman in Australia to be appointed to the position of Honorary Anaesthetist. Her story is also remarkable. Janet was born on 8 August 1874 at Broughty Ferry, Scotland. Her uncle, James Greig, had moved to Australia from Scotland a number of years before the remainder of the family followed. Robert Greig, her father, and father of four other daughters and three sons, was a strong advocate for women’s education. He wrote to his brother in 1887, asking whether a local university would accept his daughters to study medicine. 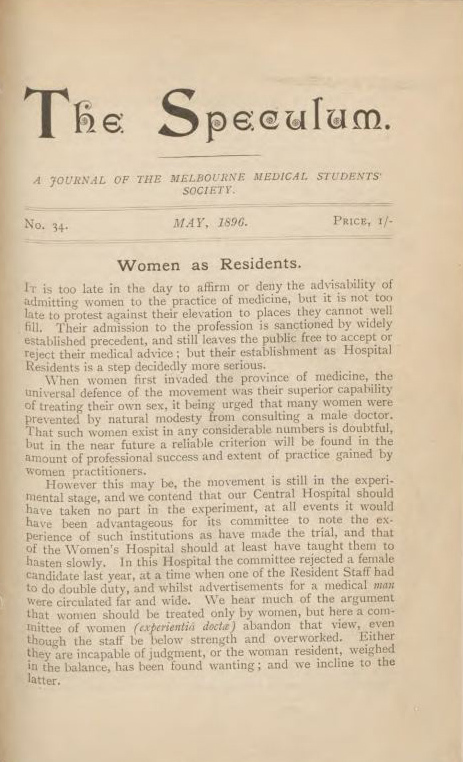 That same year, University of Melbourne admitted their first women medical students. James was able to tell his brother that Janet and her older sister Jane would indeed be able to study medicine in Melbourne. Robert Greig packed up the family and moved to Melbourne in 1889. 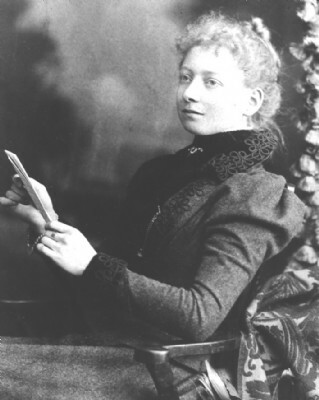 Janet graduated university in the top six of her class in 1896, along with another female student Ælfreda Gamble. Her sister, Jane, finished seventh. But the controversy surrounding medical women didn’t disappear when they graduated. Traditionally, the top six medical graduates from the University of Melbourne were automatically offered residencies at the Melbourne Hospital but nobody expected women in the top six. Taking the top six graduating men would mean bypassing three women and taking on candidates number eight and nine, although this was not without precedent. In 1891, when Margaret Whyte graduated top of her year, Melbourne Hospital refused to allow her to take up her residency. The Hospital Committee of Management made the decision with the backing of the Honorary Medical Staff. Realising her absolute defeat, Whyte waived her claim to become Resident Medical Officer at Melbourne Hospital, instead taking up a position at the Women’s Hospital as its first woman resident. For Greig and Gamble, the battle to take up their hard won residencies was just as difficult and played out in public, via the newspapers and Speculum (the journal of the Melbourne Medical Students’ Society), all in the shadow of Whyte’s situation, reimagined as a refusal on her behalf to take up the position. The hospital’s minute books from 1896 record that the Committee of Management wrote to the Dean of the Faculty of Medicine and held off making a decision until they received his response. In a game of bureaucratic tennis, the Dean duly deferred the decision back to the medical and surgical staff of the hospital. 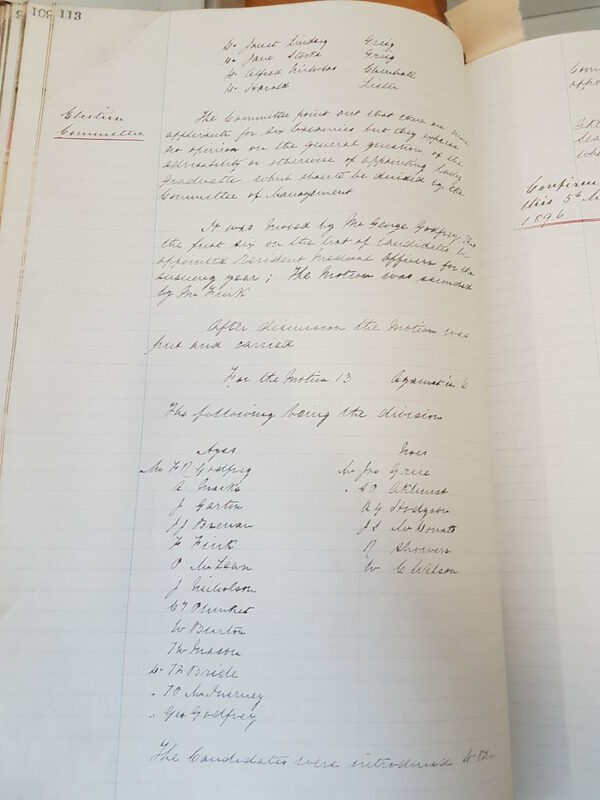 Eventually, the committee of management voted in favour of taking on the “Lady Graduates”, 13 votes to six and the names of those “on the wrong side of history” are recorded for posterity, and a summary of the committee meeting also appeared in The Argus. But, winning the battle to secure their appointments did not mark the end of the war for those women. A small article consisting of a single paragraph in the Adelaide Advertiser, dated 5 May 1897, farewells the “two lady doctors” at the completion of their residencies. It also refers to the chairman of the hospital committee, Mr F.R. Godfrey, who sadly conceded the women had been “…subjected to very unfair, ungentlemanly, and almost brutal conduct” at times. Dr Constance Stone had travelled to Pennsylvania to study medicine, graduating in 1888 and returning to Melbourne in 1890. In 1895 she invited ten medical women to come together to discuss the possibility of forming a women’s hospital. Those present at that meeting represent a virtual hall of fame in medical history: Lilian Alexander, Amy Castella, Ælfreda Gamble, Janet Greig, Jane Greig, Gertude Halley, Bertha Main, Helen Sexton, and cousins, Clara and Mary Stone. Janet Greig worked at the new hospital on Fridays, along with Main and Halley. But, in 1900 the newly formed Queen Victoria Hospital advertised for an Honorary Anaesthetist and Janet Greig, who had trained under Dr Edward Henry Embley at the Melbourne Hospital, was given the appointment. In 1903 she took on a further appointment as Honorary Assistant Anaesthetist at the Melbourne Hospital, administering anaesthesia at both hospitals. Greig was once again working with Embley and held on to that position until 1917, when she also relinquished her appointment at the Queen Victoria Hospital to take up the more senior position of Honorary Physician at the Queen Victoria Hospital. 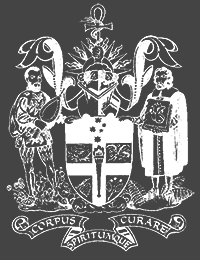 Greig was a foundation member of the Lyceum Club in 1912 and was admitted as a member of the Royal Australasian College of Physicians in 1940. She retired in 1948, which concluded a long career of 52 years. She also came from a remarkable family; her sister Jean graduated from medicine in 1896 alongside her, and her sister Grata Flos Matilda Greig was the first woman in Australia to be admitted to the legal profession. The other two sisters also attended university. Clara studied, but didn’t complete a Bachelor of Science, however opened a successful tutoring college for university students. Stella also studied law and graduated in 1911. She died in 1913 from tuberculosis. Dr Janet Lindsay Greig died on a visit to London in 1950 and was buried at the Kensington Cemetery.